The year is almost over! 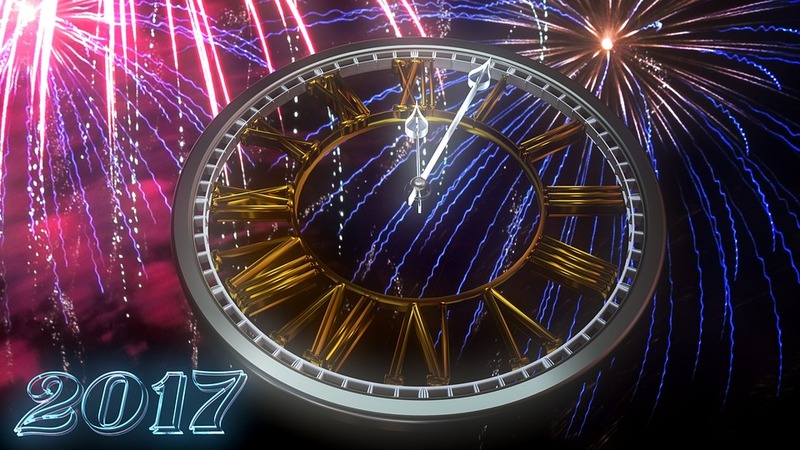 Time for a party—here’s where you can celebrate the birth of 2017 in Astoria and LIC! All events happy the evening of Saturday, December 31 unless otherwise indicated. Good food and drink, live music. Dress to impress! No cover. 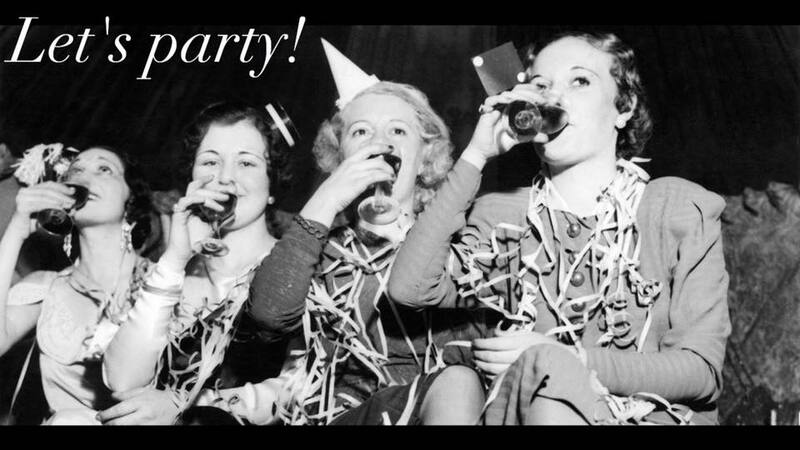 Open Bar, Dinner Buffet, Champagne Toast at Midnight and Special Guest DJ AnnaKickArse! Purchase tickets before December 20th for the early bird prices: $90 person or $175 couple. Business Attire for men and Cocktail attire for women. Purchase tickets on our website using a Paypal. 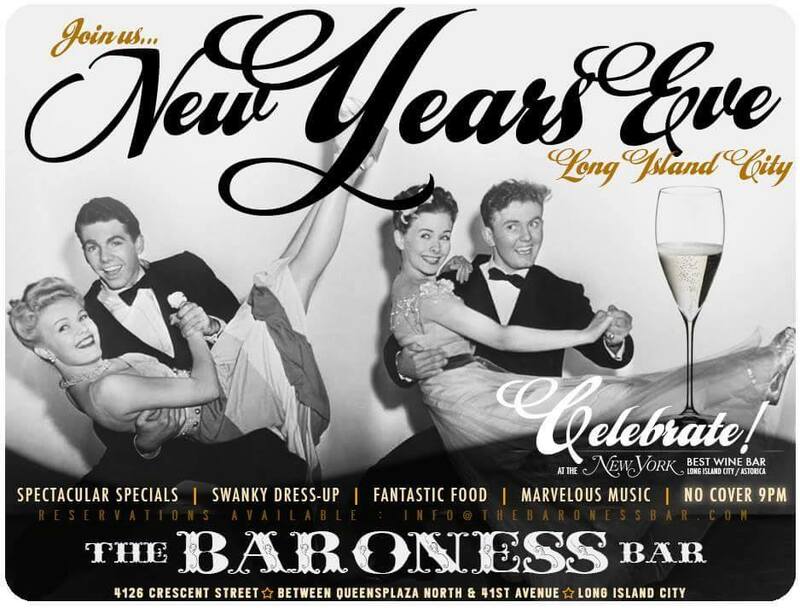 The Bonnie in Astoria hosts a New Year’s Eve party from 9 pm to midnight, with DJ sets from the Tight Fade Crew from 9pm to 4am (they play all sorts of ultra-danceable stuff: hip hop, Afro-Cuban, funk, pop, Latin beats). The open bar will include cocktails from mioxlogist Mike Di Tota’s new winter menu – the Duke of Bourbon (made with rye, Cynar and Rothman & Winter Orchard Cherry Liqueur) and the Third Player (an ancho chile-spiced mezcal cocktail) as well as some of the bar’s greatest hits like the Dirty Pickle Martini and the Good Ol’ Boy (made with brown butter-washed bourbon and pear nectar). Hors d’oeuvres will include mozzarella burrata crostini, to stones with chimichurri, fried pickles and sliders. Tickets are $80. Ticketed guests can book tables for dinner between 7 and 8:15 and then keep the table for the duration of the night. $5000 of the proceeds will go to poverty relief organization Concern Worldwide. 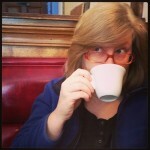 Tickets are available at thebonnie.com, and dinner reservations are available via celebrate@thebonnie.com. 3 hours of open Premium Bar & Food for $85! Live DJ! Tickets purchased through Eventbrite. 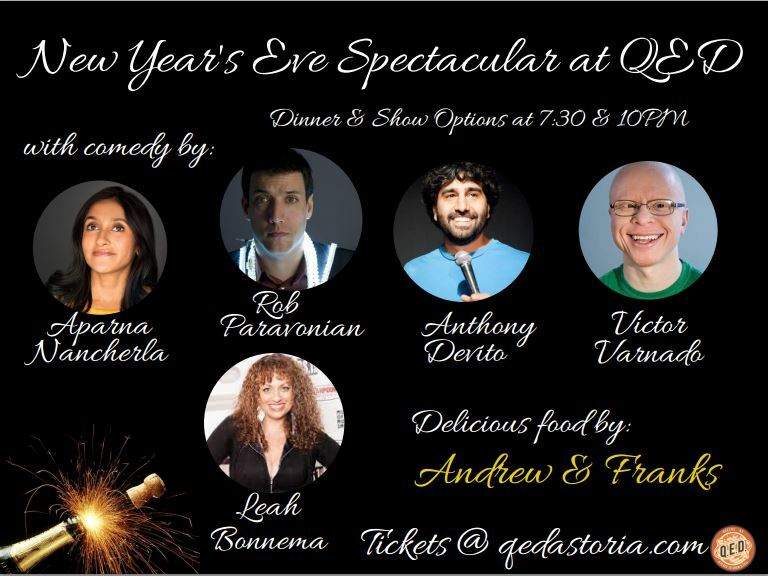 Make your New Year’s Eve reservation today. Two seatings 6pm and 9pm. MENU will be posted later this week. 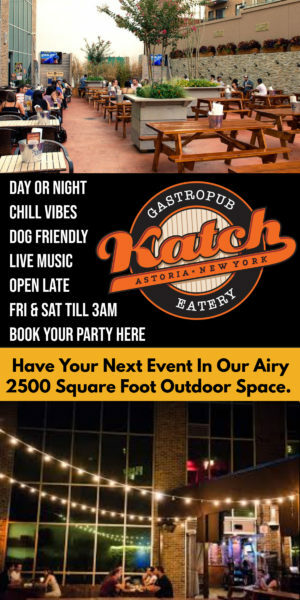 Call 718-361-0013 for reservations. New Year’s Eve we invite you to join us for the next chapter in this story as we reflect, take a breath, let go and…RESET. Together we transform and are reborn following the circle of life that is constantly rotating, the sands of the hourglass forever pouring. Q.E.D. 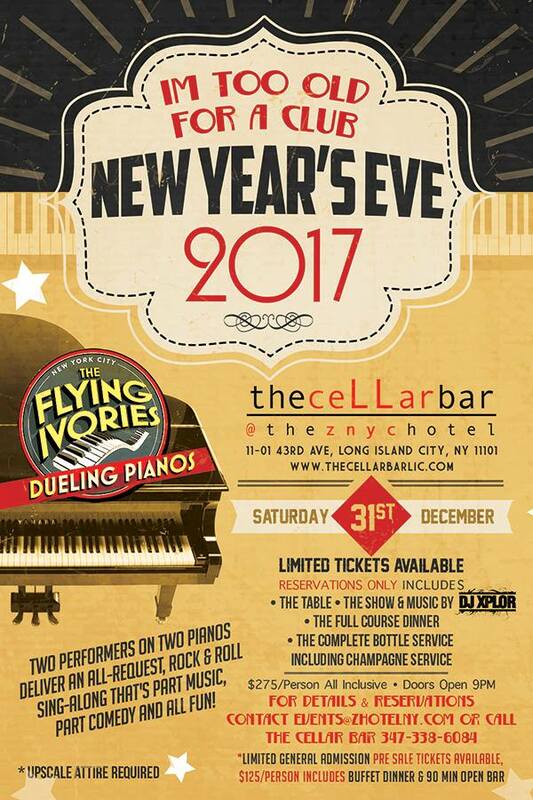 will also be offering two spectacular New Year’s Eve shows for twice the fun. 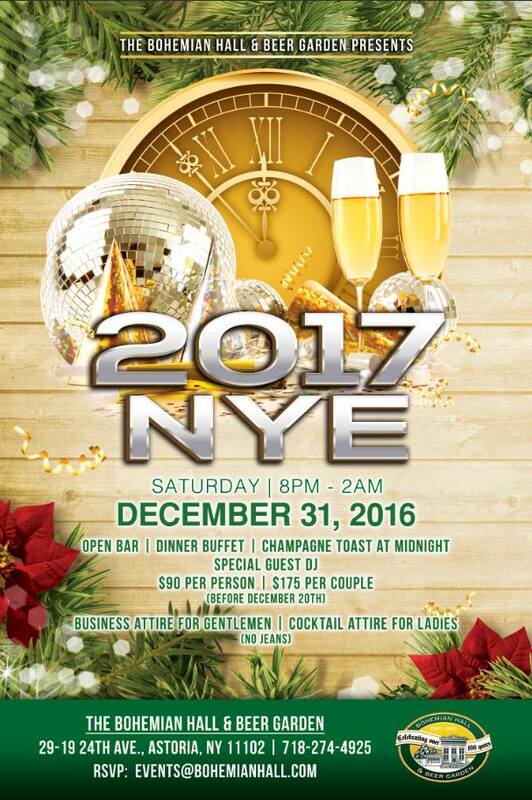 The shows will be at 7:30pm and 10pm, the second show offering a complimentary champagne toast and watching the infamous ball drop to countdown to 2017. The shows will both feature entertainment from comedians seen on Conan, Comedy Central, and VH1 and heard on This American Life. Both shows include an optional buffet of delicious food from local caterer Andrew & Franks. 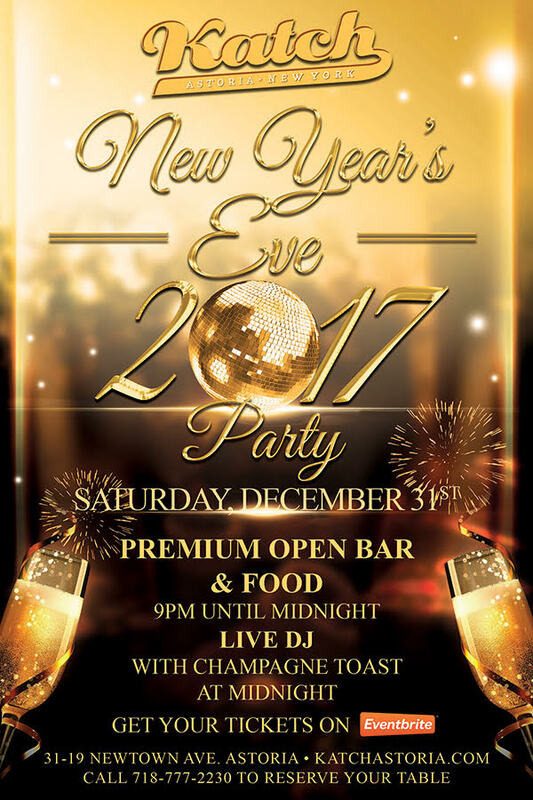 Sweet Afton’s New Year’s Eve Party will be doing an open bar and hors d’oeuvres, featuring their low key pub food dishes: fried pickles, sliders, french fries, grilled cheese, etc. 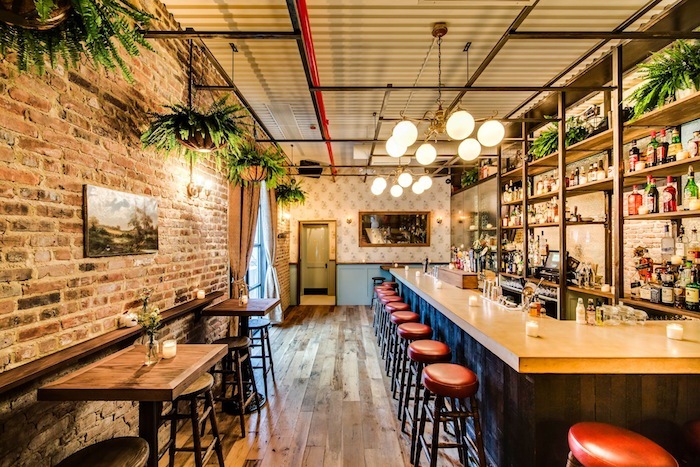 The open bar includes classics like Old Fashioned and Manhattans, as well as a selection from mixologist Mike Di Tota’s cocktail menu and beer and wine. Tickets are $75. A new feature for the bar this year is that ticketed guests can book tables for dinner between 7 and 8:15 and then keep the table for the duration of the night. Proceeds will go to poverty relief organization Concern Worldwide. Tickets are available at sweetaftonbar.com, and dinner reservations are available via celebrate@sweetaftonbar.com. 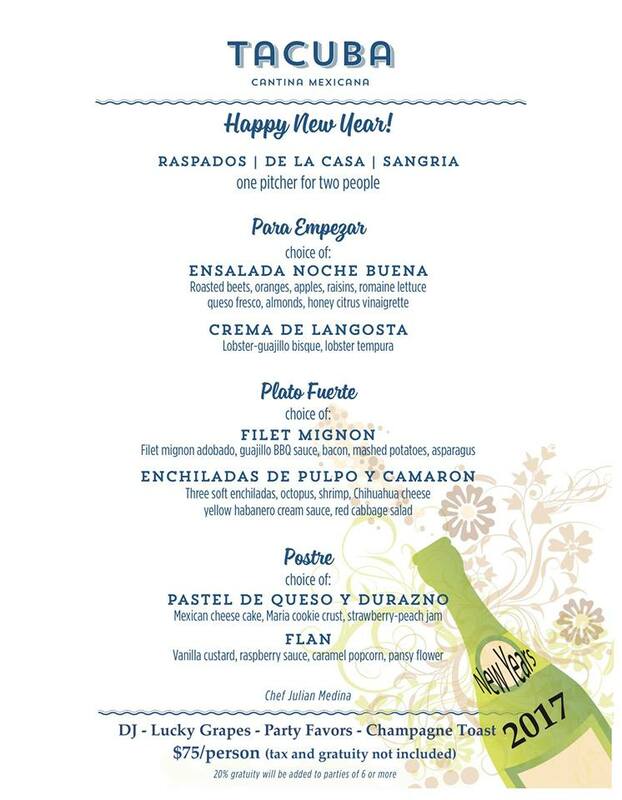 Ring in 2017 with delicious food from our chef Julian Medina, the best margaritas and authentic Mexican vibes. Check out our special prix fixe menu and give us a call to reserve a table. $75 per person. Let’s face it, 2016 was downright psychedelic. To send a prayer up to the gods, Chef Cory Estelle is planning a multi-course meal inspired by surrealist Salvador Dali’s art/cookbook “Les Dîners de Gala”. The work is a remembrance of the opulent dinner parties hosted by Dali and Gala, his wife and muse. 3) Third seating 9:45-2am ($60). This last seating is inclusive of a midnight sparkling cider toast. Noisemakers will abound. All diners will be welcomed with a glass of our “Love Drunk” punch. 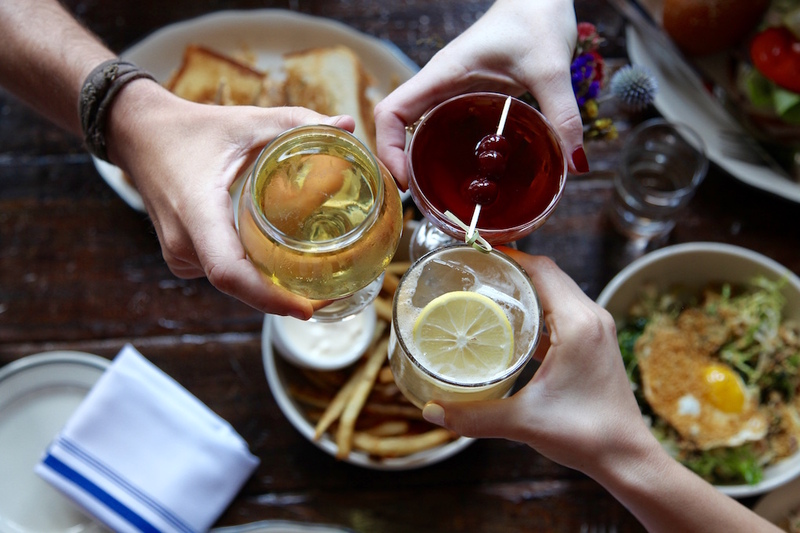 An optional beer ($25) or cider ($30) pairing is available. 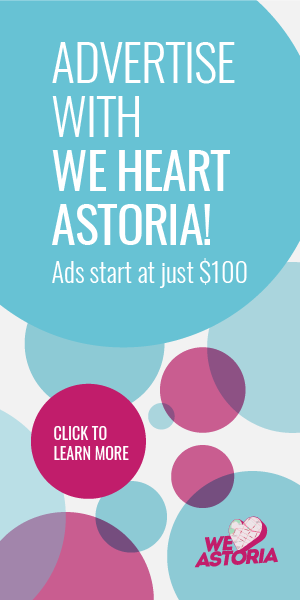 *Note: Price not inclusive of gratuity (payable at the end of your meal). Kick 2017 off on the right foot with us! 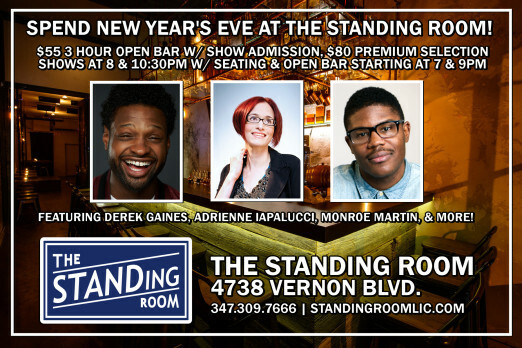 Guests on the comedy shows on NYE include Monroe Martin, Adrienne Lapalucci, Pete Lee, Luis J. Gomez and more. 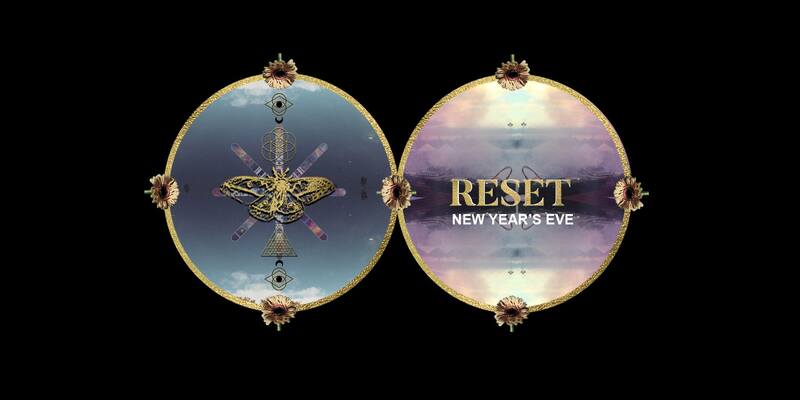 The shows are at 8:00 &10:30 pm and the ball dropping will be broadcast live. Purchase tickets here. Call now for New Year’s Eve reservations. We’re offering a 3-course prix fixe menu for $49.95, as well as our regular dinner menu. Live music at 8pm, champagne toast at midnight. 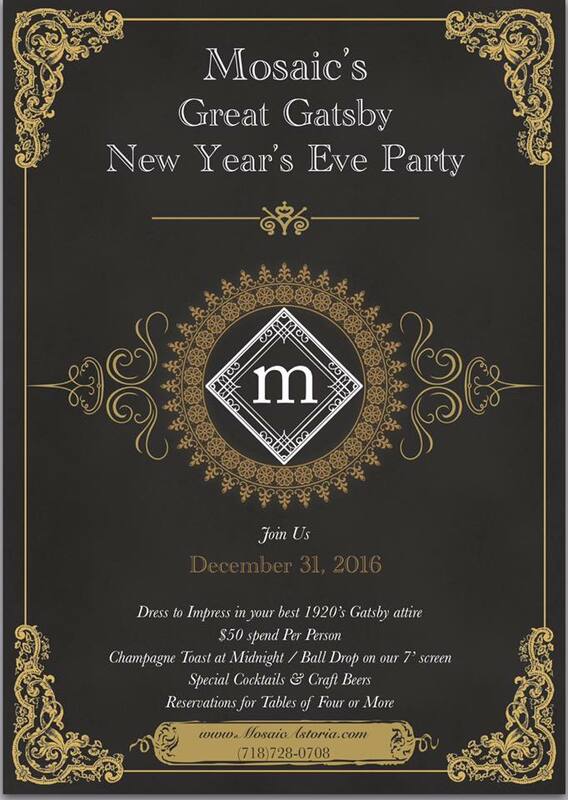 Ring in 2017 with us! 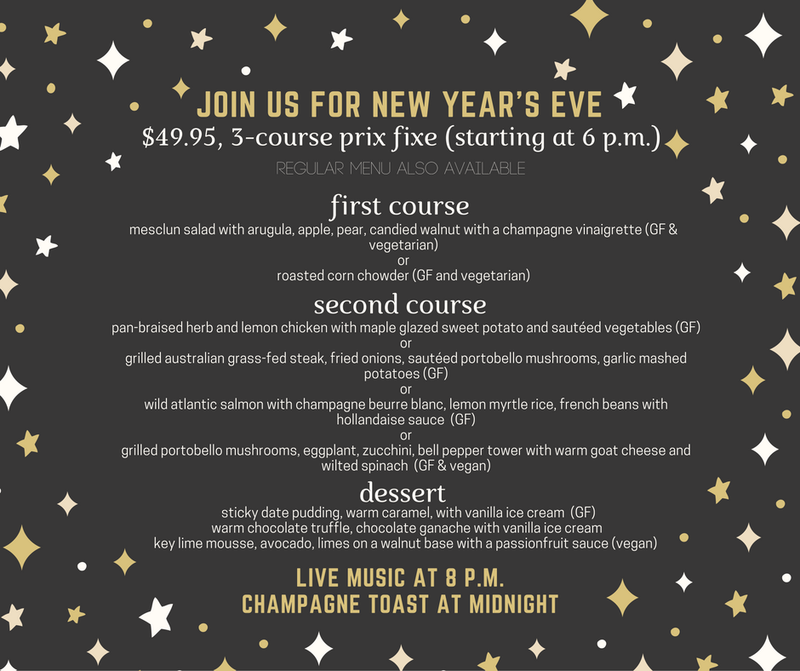 We will be serving Brunch Specials on New Year’s Eve until 4pm and offering an optional pre-fixe menu available starting at 4pm and an optional party bracelet from 9pm to 1am that includes open bar, hors d’oeuvres, and champagne toast at midnight. 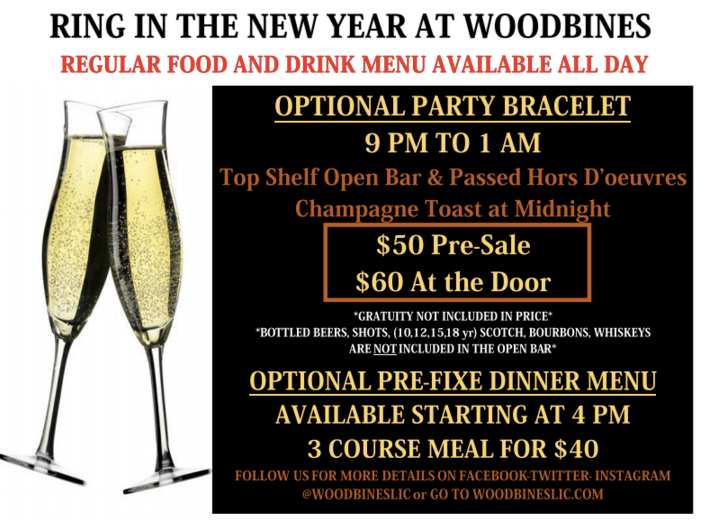 Call 718.361.8488 or email us at WoodbinesLIC@gmail.com for reservations. $50 advance/$60 at the door; prix fixe menu is $40. 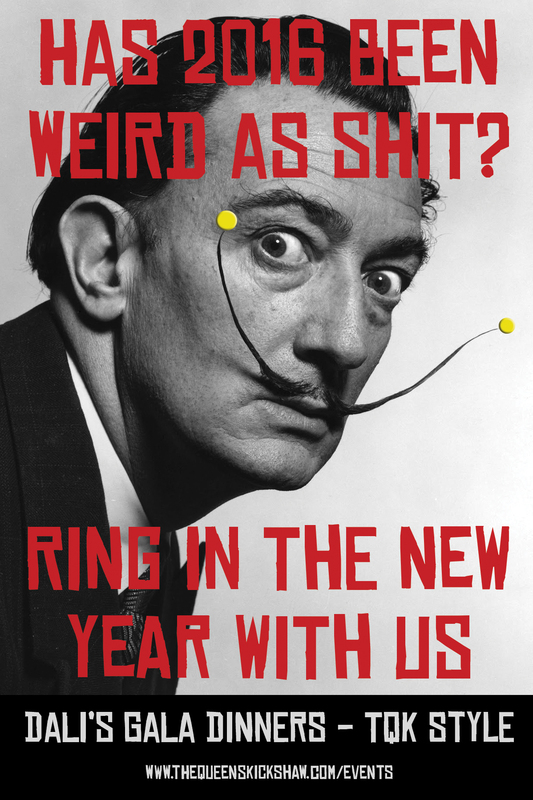 We have your New Year’s Plans ready! Find out more right here!6 Course Sit-down Dinner – Main Dinning Room $275 per person; General Admission Tickets – Lounge Area $125 per person. To reserve contact the hotel directly 212-319-7000.